Dallali Isfahani, T., Sharifi, H. (2014). A Study on the Mechanical Properties of Dual Phase Steels Prepared by the Direct and Step Quenching Procedure. International Journal of Iron & Steel Society of Iran, 11(2), 28-33. T. Dallali Isfahani; H. Sharifi. "A Study on the Mechanical Properties of Dual Phase Steels Prepared by the Direct and Step Quenching Procedure". 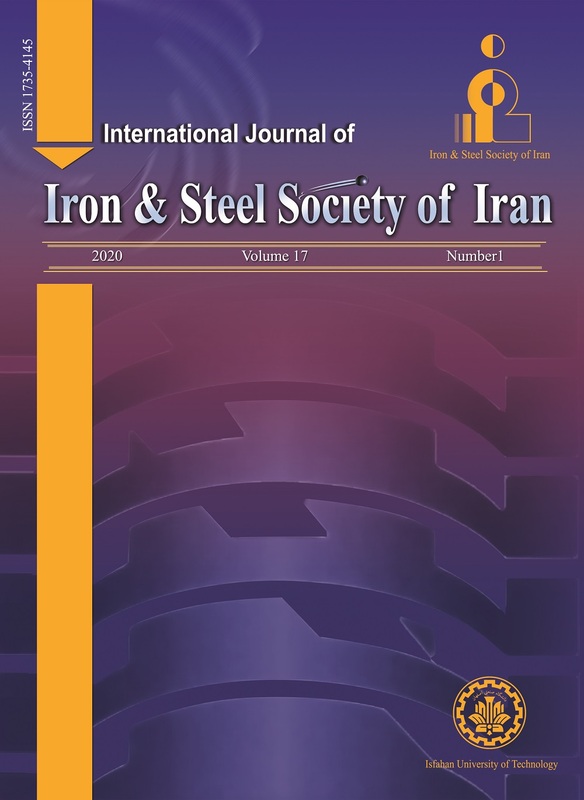 International Journal of Iron & Steel Society of Iran, 11, 2, 2014, 28-33. Dallali Isfahani, T., Sharifi, H. (2014). 'A Study on the Mechanical Properties of Dual Phase Steels Prepared by the Direct and Step Quenching Procedure', International Journal of Iron & Steel Society of Iran, 11(2), pp. 28-33. Dallali Isfahani, T., Sharifi, H. A Study on the Mechanical Properties of Dual Phase Steels Prepared by the Direct and Step Quenching Procedure. International Journal of Iron & Steel Society of Iran, 2014; 11(2): 28-33. Two different dual phase steels were prepared from low carbon manganese steel after the elimination of the banding using the direct quenching (DQ) and the step quenching (SQ) procedures. Different heat treatments resulted in different martensite morphologies, microstructures and mechanical properties. The heat treatments were designed in such a way to obtain a 0.25 volume fraction of martensite (Vm). For this reason, an intercritical temperature of 725 oC was applied. Furthermore, the tensile and impact properties were discussed. The results from the impact and tensile tests at different temperatures showed that the ductile-brittle transition temperatures for the DQ and SQ treatments were -49 and -6 oC respectively, while the DQ had better toughness. Lei Shi, Zesheng Yan, Yongchang Liu, Cheng Zhang, Zhixia Qiao, Baoqum Ning, Huijum Li: Mater. Sci. Eng. A., 590(2014), 7. P. Movahed, S. Kolahgar, S.P.H. Marashi, M. Pouranvari, N. Parvin: Mater. Sci. and Eng. A., 25 (2009), 1. Pei Li, Jun Li, Qingge Meng, Wenbin Hu, Dechao Xu: J. Alloy. Compd., 578 (2013), 320. E. Fereiduni, S.S. Ghasemi Banadkouki: Mater. Des., 56 (2014), 232. Rutao Li, Xiurong Zuo, Yueyue Hu, Zhenwei Wang, Dingxu Hu: Mater. Charac., 62(2011), 801. Pan Tao, Hao Yu, Yongfei Fan, Yu Fu: Mater. Des., 54 (2014), 914. Notch toughness of Steels, ASM, Carbon and Alloy Steels, vol, 1997, 269. D.T. Llewellyn and D.J. Hills: Iron Mak. Steel. Mak., 23(1996), 471. G.R. Speich, Fundamentals of Dual Phase Steels, TMS-AIME, 1981, 3-39. T. Waterschoot, A.K. DE,S.Vandeputte and B.C. De Cooman: Metal. Mater. Trans. A., 34A(2003). D.J. Hills, D.T. Llewelyn and P.J. Evans: Iron Mak. Steel. Mak., 25(1998), 47. Le-yu Zhou, Dan Zhang, and Ya-zheng Liu: Inter. J. Mine. Metal. Mater.,21 (2014), 755. T. Greday, H. Mathy, and P. Messien: About different ways to obtain multiphase steels, AIME, New Orleans, (1979), 260. T. Tanaka, M. Nishida, K. Hashiguchi, and T. Kato: Formation and properties of ferrite plus martensite dual-phase structures, AIME, New Orleans, (1979), 221. P.R. Mould and C. C. Skena: Structure and properties of cold-rolled ferrite-martensite (dual phse) steel sheets, AIME, Chicago, (1977), 181. N. J. Kim, G.Thomas: Metall. Trans. A, 12 (1981), 483. N. J Kim, A. H. Nakagawa: Mater. Sci. Eng., 83(1986), 145. X. Cai, A. J. Garratt-reed, W. S. Owen: Metall. Trans. A: 543(1985), 16. R.G. Davies: Formable HSLA and Dual Phase Steels, AIME, New York, (1979), 25. A.R. Marder: Formable HSLA and Dual Phase Steels, AIME, New York, (1980), 87. T. Jurukuwa, H. Morikawa, H. Takechi and K. Koyama: Structure and Properties of Dual Phase Steels, AIME, New York, (1979), 281. A.F. Crawley, M.T. Shehata and N. Pussegode: Fundamentals of dual phase steels, TMS-AIME, New York, (1977), 151. A.M. Sherman, R.G. Davies and W.T. Donlon: Fundamentals of dual phase steels, TMS-AIME, New York, (1981), 85.